1978 On April 26 arrived to New York City with his family. Starting soon after his arrival, and until 1984, Yuri worked as a textile designer for Burlington Industries. 1979 First charcoal drawings on paper, depicting New York beggars, vagabonds and street musicians. Despite the difficulties encountered during his early years in the United States, over the next six years, working at night after his day job and on weekends, Yuri was able to create over 700 drawings. 1984 After successfully passing a highly competitive three-day exam, Yuri was admitted to the United Scenic Artists Union and began to work for various New York City theaters. 1986 Started to work as a scenic artist at the New York Metropolitan Opera House, where he spent 10 years until in 1995 his health dramatically worsened. During this period he worked extensively on numerous opera productions, including sets for “Aida”, “Turandot”, and Wagner’s entire “Ring Cycle”. The large scale of operatic sets influenced Yuri’s own work, for he began concentrating on large oil paintings, slowly abandoning his previous medium, charcoals and pastels. Nevertheless, the theme of his works remained focused on inhabitants of New York. Together with his family traveled several times to Europe, visiting museums and galleries. These trips had a profound influence on the further development and expansion of his understanding of art. During this period, continuously searching for the right way to excel, he grew considerably as an artist. 1993 In December, Yuri suffered a heart attack and shortly afterwards underwent a quadruple-by-pass operation. 1994 Yuri was placed on disability for a six months period following his heart surgery; at the end of the year, he resumed work at the Metropolitan Opera, but only on a part-time basis for two days a week. 1995 In November Yuri was diagnosed with stomach cancer and on December 1 underwent major surgery. Following the surgery, Yuri was placed on permanent disability. 1996 Visited Russia for the first time since 1977 for the purpose of alternative medical treatment. Yuri spent most of the year recovering from surgery, working very occasionally on some of his oils. 1997 Despite his illness, he began work in his studio with increasing vigor on new, more colorful oil paintings. He continued to focus on one of his favorite themes – “a man in New York”. 1998 On June 8, Yuri became a grandfather, with the birth of his first and only grand-daughter, Xenia de Cazotte. In September, Yuri had a one-month one-man show at the Gregory Gallery in New York. Over a period of several months he prepared for this exhibit, painting many new works. 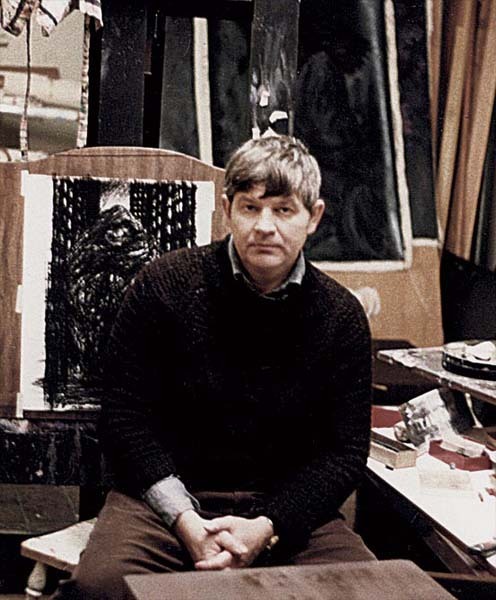 1999 Despite his poor health, at the beginning of the year Yuri was able to paint several large oil canvases. During the summer months he went to Russia for the last time to visit his school friends. In December, Yuri underwent another stomach operation which confirmed the metastasis of his cancer. 2000 On June 30 Yuri died at age 62 in his apartment in New York City. During the months preceding his death he continued to produce small drawings. Yuri Grachev is buried in Kensico cemetery near New York City, not far from his compatriot, Sergei Rachmaninov.